Extinction has always been a part of island life. Why are smaller islands home to fewer species? In part, because of extinction. Small islands have less habitat, so they have smaller populations of plants and animals. If something bad happens—a severe drought or terrible storm—these small populations are at risk. On a continent, if a habitat is temporarily unlivable animals can move to a nearby place that is still okay. Once the habitat recovers, they can move back in. On an island, the sea blocks this kind of movement. If a species gets wiped out, it may be gone for good. These natural extinctions are a key part of Caribbean ecology, but they are also rare. Without humans, extinctions and new colonizations of plants and animals balance each other out. Both happen rarely, and the mix of animals and plants on an island changes very slowly. The Spotted Woodslave is found only on St. Martin. Humans brought extinction with them when they arrived in the Caribbean. The first wave came as Amerindian people colonized the region. Evidence suggests that many prehistoric animals, like the giant sloth, Jamaican monkey and some large rodents died out during this time. The extinction of large animals after prehistoric hunters arrive in a new land is a pattern seen all over the world. European colonization brought a second wave of extinction. The victims included smaller mammals, birds and reptiles. The introduction of foreign species—like rats and mongoose—led to many extinctions. The widespread clearing of land to grow sugarcane and other crops was also a key cause. Today, the threat of extinction continues, with a new twist. On Dominica, the passing of Hurricane Maria set off a desperate search for the Sisserou, a parrot that lives only on that island. Before the hurricane, the population was estimated at just a few hundred. Scientists made an expedition to check on another rare bird, the Barbuda Warbler, after that island was devastated by Hurricane Irma. Animals native to the Caribbean have survived hurricanes for millions of years before people arrived. But things have changed. Many Caribbean animals are barely hanging on. A hurricane that might be a hardship to a healthy population could be the end of the line for a species already on the edge. On St. Martin, it has been a relief to see the two lizards that live nowhere else in the world. The Bearded Anole is common and seems to be doing just fine. The Spotted Woodslave is more mysterious. 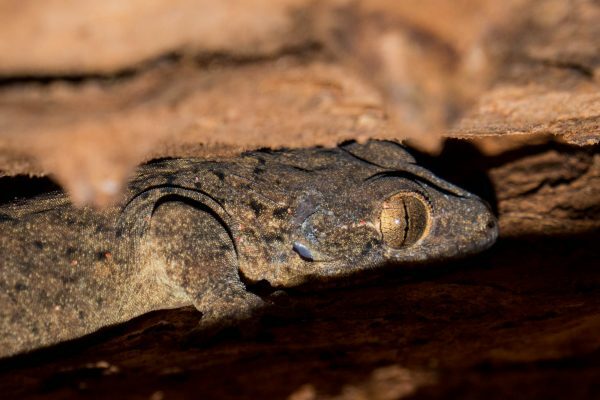 It hides during the day, often under the peeling bark of a large tamarind tree. It survived, but many large tamarind trees were knocked down by Irma. This species should be watched more carefully, and the habitat it requires should be protected. Will climate change bring a third wave of extinction to the Caribbean? Stronger and more frequent hurricanes will put many species at risk. Our best defense is to preserve habitat and boost populations of rare species between storms. The time to start that is now.